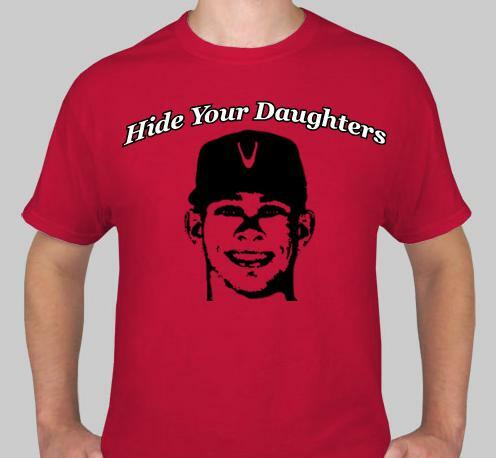 The “Hide Your Daughters” T-Shirt | That's Twins Baseball. A Minnesota Twins Blog. It’s finally ready for pre-order, the “Hide Your Daughters” T-shirt. 5.6 oz. All colors are a poly/cotton blend. Preshrunk. Taped shoulders. Double needle stitching throughout garment. 50% cotton 50% polyester. I will be selling it for $17.00 pre-sale so get your orders in now before it goes up to the regular price of $21.00 (shipping included in cost). Pre-sale ends next Friday. Please allow 10-20 days after pre-sale ends for delivery. Because not everyone has Paypal, I’ve set up a form below to email me a payment method. If you can’t do Paypal, cash is preferred. Fill out the form below and I will get back to you about your preferred payment method.